Apparently, there is no huge media event. No big arena has been rented out, and the hype and hoopla has been bottled up. 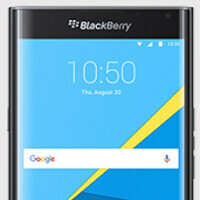 While other carriers hold big media events to unveil a new phone, it appears that BlackBerry has just decided to start accepting pre-orders for its first Android powered handset, the BlackBerry Priv. The big question has been answered as the slider is priced at $749 USD. The second biggest question has also been answered as the device will ship on November 16th. The model sold by BlackBerry is not compatible with Verizon, Sprint or U.S. Cellular. Here are the final specs. The phone has a Gorilla Glass 4 protected 5.4-inch dual-curved screen, and is powered by the Snapdragon 808 chipset. The latter features a hexa-core CPU and the Adreno 418 GPU. 3GB of RAM is inside, along with 32GB of internal memory. A 2TB capacity microSD slot is aboard for those seeking additional storage. An 18MP Schneider-Kreuznach camera is on back, with OIS, and a 2MP front-facing camera handles selfies and video-chats. The 3410mAh battery provides power for 22.5 hours of mixed usage, and there is a rapid recharge function. The Priv is 9.4mm thick and weighs 192 grams. So there it is folks, you can now go ahead and pre-order the unlocked version of the Priv, which will work with FD-LTE bands 1, 2, 3, 4, 5, 7, 12, 17, 20, 29, 30. UPDATE: Someone must have goofed at Waterloo. BlackBerry has taken down the page. $749 BlackBerry? Really? I just don't see how this price is going to appeal to the average consumer. And no release event? Where is the marketing? I hope you know what you're doing here, Chen. With that being said, even though I do not agree with the pricing since BlackBerry is trying to win back consumers, (it's fine for me, as I personally feel it's worth the price) and the fact that there is no marketing so far, I will still be purchasing a Priv. Hopefully, carriers will have some good deals going on for those who wish to purchase the Priv, but find the price too high. I have to be honest with you Meanest, It doesn't look good for BB with that price. From a hardware standpoint, it can keep up with other top of the line devices, its focus on security might get them some sales, It's biggest selling point is that there's no other phone like it on the market with its slide-out keyboard... But I remain very concerned with what I've seen. I'm concerned about the price. I know Chen said that it wouldn't be cheap, but this is rather expensive for a handset that BlackBerry is looking to use to win consumers back. I hope that the price drops quickly, and that carriers are offering some good deals on the Priv. Well, we're just going to have to wait and see. Hope you enjoy your new BlackBerry, let me know what you think when you get it. I agree, but I just don't see many average consumers buying it at this price. I hope I'm wrong. No news on subsidized prices from carriers yet? You know full well people that upgrade to a new iPhone every year aren't paying full price every time. I saw some subsidizes pricing in the Canada. No word yet on the U.S., but I'm sure there will be subsidized pricing here. T-Mobile will probably have it for zero down. Lol, I noticed that myself. Somebody jumped the gun! I hope that they change pricing as well. If Rogers really is selling the Priv for $799 Canadian off contract then I'd bet the price will be closer to $650 American in the U.S.A. Just a guess. Well, they do bring something unique to the Android Market, and they will appeal to those who intend to use their smartphone for business related matters.... .... I wonder, a while back there was an article that Obama said that he wanted to use his iPhone but that the secret service said that he would have to use BlackBerry instead.... I wonder with this latest phone if it means that Mr. President is officially going Android? I think, with a target of 5 million handsets, especially to business customers, this price should be good, An organisation that prioritize privacy will be the organisation who'll not mind splashing an extra 150 or 200 than the price we all envisage. Just a few minutes ago, in our local business radio station, 2 Blackberry executives appeared on our early morning business Breakfast show talking about Blackberry services, cloud and the Priv. In my 2 decades of life in this country, I've never experienced Blackberry executives been called to the studio or Blackberry asking for a slot of air time. What I'm trying to say is, the early morning show, was the perfect time to talk about the Priv since that's the time all of us drive to work. And they put it all together (security, cloud, BB services and the Priv) in such a way that you can feel that they're concentrating now, to get the enterprise / business consumers back in their pocket. They should have gone for 7420, at least price would have sounded reasonable. LMFAO My screen name is QWERTYphone and even I wouldn't spend $750 on this. $300 outright is my MAX I'd pay for potentially the last phone from a dying company. I agree the price is higher for consumers, but it is reasonable price considering the hardware features and specs. It has a curved screen which bumps it up, also the additional manufacturing process of a physical keyboard which is touch enabled. BB most likely could not mass produce the amount of devices of say like a galaxy phone, so the that would affect the price too. If they market, I bet the phone would be even more. Though they need the exposure and price point to appeal to many consumers. It'll be tough for them. They should of skipped the newest curved screen technology. $750 retail is way too high. However, if Verizon carries it and I can somehow trade in my GS6 for it (at least for a discount), I may be inclined to do so. I'm just not sure if I can part with my fingerprint scanner. well they don't sell phones for the average consumers. They only target enterprise customers and maybe the high end customers that value security featurse. Expensive compared to what? If it ran BB OS10 you could argue that it's over priced. But this is an Android flagship with features no one else has (security, physical keyboard) and quality that is second to none. Stop thinking about it as a BlackBerry in terms of OS. Nothing against the Chinese, but let's see how long these "premium" phones last in the real world before we anoint them as best bang for the buck. I'd much rather spend $750 and know my phone will last longer than the service contract. Should that happen, I at least hope it will bring about the last nail in the coffin for your trolling. I was really looking forward to this phone but the 2mp front facing camera was a dealbreaker. Might be negligible to some of you guys but not me. 5mp is a standard now.